Professional sandblasting for you home or commercial swimming pool will bring back a clean and fresh surface. Using our powerful wet sandblasting technology we can remove that unwanted, dated and faded concrete surface and leave you with a spectacular smooth finish. Doing a pool renovation? We can remove that old paint work, prepare the surface for a repaint and give the marble sheen a profile. We can prepare for tilling, pebbling or fibreglass liners. Sandblasting is commonly used in the restoration of an old or damaged swimming pool, contact us today for all you Sydney sandblasting needs. How to restore a faded swimming pool? Restoring a faded swimming pool requires the right equipment and should only be done by someone with experience. 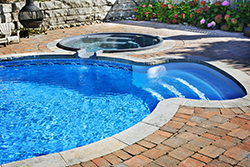 Our pool blasting specialist will remove the old faded layer and expose a fresh surface so that it is ready to take a fresh coating.